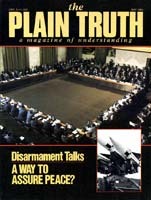 THE PLAIN TRUTH Not Just Another Magazine! Problems? Mankind has many. And few people need to be reminded of them. How, then, does The Plain Truth differ? By pointing out the causes of — and the solutions to! — this troubled world. YOU WANT to know about a crisis or tragedy on the world scene? You want a description of the problems humanity is facing? Dozens of newsmagazines and periodicals are readily available to supply all the details. Extensive networks of correspondents in critical areas of the globe supply a continual flow of data concerning the conflicts and troubles on earth today. And, thanks to state-of-the art technology, a lengthy, impressively documented, colorfully illustrated story about some late-breaking event can make the transition from reporter's note pad to final press proofs in a matter of hours or days. Editorial slant and accuracy vary from one publication to another. Yet, the world's mass-circulation publications describe quite effectively the dilemmas humanity is facing. What, then, is the need for — the unique contribution of — the Plain Truth magazine? But The Plain Truth is different from any other publication! It is unique. It goes beyond merely reporting what is taking place in world events. It tells why. It explains solutions. It supplies the missing dimension in reporting and analysis. It reveals the solutions to mankind's ills and reveals how those solutions could now — or ultimately will — be put into effect. And these solutions do not just come from "a highly reliable source." They come from the impeccably reliable source: the Creator God — through the documents he has inspired and has had preserved for us and that are known collectively as the Bible! Far from being a dusty collection of folk history and ancient musings, the Bible is as up to date as tomorrow's news. In fact, it has already scooped the trends in tomorrow's news, because one third of the Bible is prophecy, revealing ahead of time the course of mankind's history. Since those on the staff of The Plain Truth have the advantage of understanding these prophetic trends, news events can be put in the proper perspective it simply would not be possible to without that comprehension. Will the problems of humanity ever be solved? If so, how? And when? There's no need to wonder about the answers. The Bible reveals them. The Plain Truth proclaims them. In addition to the prophetic element, the Bible reveals the laws of successful, abundant, happy living. These laws define how individuals and nations should conduct themselves if they wish to have peace and prosperity. All the problems and troubles on earth result from the breaking of these divinely ordained laws. When an article in The Plain Truth deals with a problem, it does so in the light of the immutable laws that regulate the universe. "The curse causeless shall not come," the Bible declares (Prov. 26:2). The unfortunate events and heartbreaking calamities that constitute today's bad news do not just "happen." They are caused. They would not have to take place. They could be avoided. The Plain Truth shows how. This is vital knowledge! One does not have to read many issues of The Plain Truth to be aware of a recurrent theme: the approaching intervention of God in world affairs to replace humanly devised systems of government with the government of God administered by the returning Jesus Christ. Most articles in this magazine refer to that great event, connecting it with the ultimate answer to whatever problem or problems are under discussion. Some, however, have misunderstood. They have concluded we are saying that the solutions to all the world's ills will not be available until Jesus Christ comes again and sets everything right. The answers to many of mankind's problems are already here! They have been available from the beginning! The Bible records divinely revealed laws that would eliminate the problems humanity is facing. These laws work when they are applied. Stunning examples exist in the world of individuals or groups who have knowingly or unknowingly obeyed certain of these laws and who have been plentifully rewarded as a result. But such examples are all too rare. For the most part, these divinely ordained laws have not been applied. They have been ignored and sometimes even suppressed. You don't think members of "enlightened" societies would treat truth that way? Just take one example. Consider the suffering produced by smoking. Here is a legitimate problem — one that causes human suffering. Surely in any civilized nation it is a rare person involved in the growing, production or smoking of tobacco who is not aware of the physical evidence showing smoking can be injurious to health. Does the mere fact of realizing that stop the proliferation of smoking — induced diseases? No, it does not. Tobacco products continue to be produced, sold and used. The very governments that, by one agency, warn of the hazards of smoking, often, by another agency, subsidize with taxpayers' moneys the production of tobacco. The toll in ravaged health continues apace. When Jesus returns to earth, he will not need to reveal some hither to unsuspected cause of tobacco induced ills. The causes are already identified. The solution, too, is already known: stop doing what causes the problems. What has been and is now lacking is a divine authority to enforce the solutions among nations. The same can be said of a host of other problems humanity faces. But the individual today, who wants to come under that divine authority now, can do so — and quit smoking, and quit a host of other evils he or she has been engaged in. What a paradox! On the one hand, human beings have developed incredible technological marvels that should make life easier and more fulfilling for everyone. On the other hand, some of those very technological advances threaten everyone's existence. What is wrong? Why is this world in such a predicament? The Plain Truth continually points out the answer in discussing the world's troubles. The fundamental problem is human nature. It lies at the root of all man's ills. The evil that human beings do, they do under the influence and sway of what has become their human nature. Very few, though, have understood the real nature of human nature. The Plain Truth magazine has defined the basic trait of human nature in the simple terms of "get" versus "give." "Getting" is the way of human nature. It expresses itself in greed, selfishness, the desire to take for the self rather than give to others. The Bible gives a list in II Timothy 3:2-5 of the prominent characteristics of this modern age. That is, it addresses the problems. And it gives the solutions. It speaks out on such evils as crime, preparation for and waging of war, dishonest business practices, disturbed children, the breakdown of the family unit, sexual immorality, the mad craze for pleasure and gratification of the senses, mental illness, economic stress, spiritual confusion. The introductory words of this scripture form the basis of it all: "For men shall be lovers of their own selves...."
Another passage from the Bible expresses in one word the underlying cause of this world's ills. It speaks of "the corruption that is in the world through lust" (II Peter 1:4) — that is to say, because of greed, because of seeking to get" at the expense of others. "Why are there wars and strife?" the Bible asks. Because there is selfishness in human nature, it answers (Jas. 4:1-3). But the Bible reveals human nature can be changed from serving the self at the expense and suffering of others to loving one's neighbor and even one's enemies. Can you imagine what this world would be like if people spent more time and effort giving than they do seeking to get? What if nations, instead of threatening to blow each other up, sincerely sought to help each other? If, as God's laws show how, individuals and nations would put the interest of others first, peace would break out all over the world.. It is human nature that needs to be changed. It's as simple as that. We could all have prosperity and happiness now. That is why The Plain Truth addresses — why it must address the world's problems. It must announce the causes and the solutions of those problems. We would, of course, like to see the knowledge acted upon by all, now. But whether or not it is, we are responsible to publish it. No other mass-circulation magazine in the world even claims to fill the role being filled by the magazine you are at this moment holding in your hands! The mission of The Plain Truth in dealing with the world's crushing problems is therefore twofold: 1) proclaim the good news of the world tomorrow When divine government under Jesus Christ will enforce — the solutions to the world's problems; 2) reveal how those who are willing may even now, by yielding to God and receiving his Holy Spirit, overcome their human nature and the problems it causes. But what is the real force behind human nature that must be overcome? You may be surprised at the answer! Be sure to write for a free copy of our new booklet Human Nature — Did God Create It? See inside front cover for addresses. Problems Mankind Can & Cannot Resolve! 1900 - The electric-arc steel-making furnace is used for the first time by Paul Heroult. 1903 - December 17, the Wright brothers achieve a powered flight of 59 seconds at Kitty Hawk, North Carolina. 1905 - Albert Einstein, a German Jew, proposes his "Special Theory of Relativity," expressed in the equation E=mc2. 1907 - Louis and Auguste Lumiere make color photography available to the public with their Autochrome process. 1911 - Stainless steel is patented by German scientist P. Monnartz. 1914 - The Panama Canal, connecting the Atlantic and Pacific oceans, opens. 1926 - Scottish inventor John Logie Baird demonstrates television in his Loridon laboratory. 1927 - Charies Lindbergh completes the first solo, nonstop transatlantic flight from New York to Paris. 1928 - John Logie Baird invents the video disc although it will not become popular until 50 years later. Alexander Fleming discovers that the mold Penicillium Notatum kills many bacteria harmful to man. 1929 - The first transmission of color television, between Washington, D.C. and New York, takes place. 1930 - The first tape recorders to use magnetic plastic — not metal — tape are introduced in Germany. W.J. Kroll of Luxembourg initiates his research into the metal titanium that will make possible the high-speed aircraft and space equipment of today. Briton Frank Whittle patents the gas-turbine jet engine. 1931 - The Empire State building in New York City, standing 1,248 feet (380Am) high, is completed. The first regular telecasts begin October in Moscow. On December 23, TV station W6XAO begins regular transmission on the U.S. West Coast. 1933 - Frequency modulation, FM radio, is perfected by U.S. scientist Edwin Armstrong. U.S. astronomer Karl Jansky invents the science of radio astronomy, letting men "see" deep into space. 1938 - Using new, quick-drying ink, Hungarian Lazlo Biro invents the ball-point pen. German physicist Otto Hahn splits atoms of uranium to produce a reaction called nuclear fission. 1939 - The jet age begins with the flight of a German Heinkel 178 aircraft, powered by a gas-turbine jet engine. 1943 - The world's first operational atomic reactor is built in Oak Ridge, Tennessee. 1946 - J. Presper Eckert and John W. Mauchly of the University of Pennsylvania invent the first all-electronic digital computer. 1947 - The first microwave cooker goes on sale in the United States. 1948 - The first transistor is developed at Bell laboratories in the United States. 1952 - A Japanese company called Sony markets the first pocket-sized transistor radio. 1954 - Texas Instruments invents the silicon transistor. 1956 - The desk-top computer is developed in the United States by Burroughs. Alexander Poniatoff demonstrates his videotape recorder, which produces a near "live T.V." image. 1957 - Sputnik I is launched into space by a Soviet SS-6 missile. 1961 - Soviet cosmonaut Yuri Gagarin is the first man in space. The first light-emitting diode (LED) is invented by Nick Holonyak Jr. of the United States. The pocket calculator revolution begins. 1962 - The era of transatlantic television begins as Telstar is launched by the United States. 1963 - The compact cassette tape is introduced by the Dutch firm Philips. 1968 - Apollo 8 successfully orbits the moon and returns to earth. 1969 - July 20, Neil Armstrong in the Apollo 11 spacecraft is the first man to set foot on the moon. 1971 - The microprocessor computer chip is introduced by Intel of California. 1976 - Viking I makes a successful landing on Mars. It then sends back clear color photographs of the Martian landscape, seen simultaneously at Pasadena's Jet Propulsion Laboratory and the Ambassador Auditorium. 1978 - Louise Brown, born in July in Oldham, England, is the first test-tube baby. 1981 - France's Trains a Grande Vitesse become the world's fastest trains by achieving a speed of 235 mph (380 km/h), supplanting the previous record-holding Japanese Bullet trains. Source: The Timetable of Technology.' A Record of the 20th Century's Amazing Achievements, Patrick Harpur, Ed., et.a!. Hearst Books, 1982. Note: The total number of deaths in the conflicts listed above would be the equivalent of removing the populations of Finland, Iceland, Ireland, Norway, and the United Kingdom from off the face of the earth. Sources: Encyclopaedia Britannica, and Darkest Hours by J.R. Nash.